Every awning owner knows it! 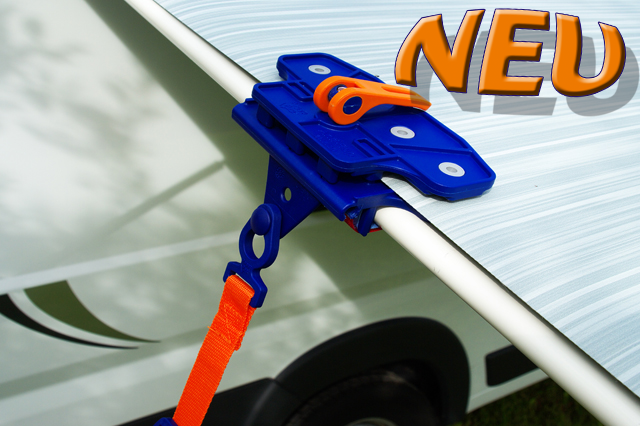 Your awning is perfectly safe with our Fix&Go Anker Plate 2.0 and our TieStrap secured to the ground. But even though, the awning cloth won’t stop making annoying sounds when its moved by the wind. Camping lingos also call this noise a “flapping”. We achieved now to almost completely remove this noise with our new designed Fix&Go AntiFlap awning clamp. Simply slide the clamp sideways onto the cloth, then place it on the rafter (tension rod), and then fold the lever down to close it. If you don’t own any tensioning rods, you can simply acquire them from your awning manufacturer. The small pillows inside the clamp, which are made of really soft synthetic material hold your cloth without damaging it! To perfectly secure everything, strain the silicon tapes around the tension rod. Due to the varying shapes and sizes of the rods in the camping industry, there are grid holes in the silicon tapes for the perfect fit. The material, the tapes are made of prevents the Fix&Go Anti Flap from sliding around on the round tension rods. Next to reducing the noises, our Fix&Go Anti Flap is also ideal for additional securing and anchoring of your awning. There is a built-in welting which fits perfectly for our optionally available TieStrap. When straining the lever, the T-Connector of the TieStrap automatically gets pinched and prevents it from sliding out of the welding in all kinds of movement. Your awning is double secured when you simple anchor the TieStrap with the ideal Peggy anchoring and the relieving spring to the ground. It’s possible for bigger awnings to you use more Fix&Go AntiFlap’s on each side of the awning cloth.